A conscious creature develops a personality over time, though differently than it grows physically. An individual human, say, is governed by genetic code hardwired into every bit of body; its height and skin color determined and unchangeable save an external change. In this way the body is determined and fraught with nature. In other ways, aspects about an individual human are subject to their environment—a socio-economic standing, a gender, a fight for survival. A personality, though is complicated. The manner by which a human presents themselves outwardly is governed by a genetic mix, et cetera. Each person may spend their whole life becoming themselves, as if there was a post erected to pass. Humans are all actors, no? So, how long does it take to become someone else? For pouring himself into Christy Brown, Daniel Day-Lewis earned himself the first of three Best Actor awards out of six nominations. By any account this actor’s actor has found himself in extreme fortune and generous timing; each of his roles triumphs as a character vehicle, whose environment and/or plot places second and/or third. His work is always a conscious choice of character, too. Since 1982, he has only twenty credits to his name, and only 13 roles since (including) My Left Foot, his first victory, and the one for which he most carefully considered the role. To play cerebral palsy and not to mock it or make light of it is a tremendous feat of mind-meld. The disease is itself a parable of the physical, a body, as it turns out, not broken, but different. Here, Day-Lewis shines on all fronts. Looking back 30 years, six nominees, and three wins recognizing the actor’s actor as a chameleon off sorts. For this actor, himself is his other selves. Other actors can claim method, so Daniel Day-Lewis is not alone atop his triumphant mountaintop. The most decorated actor of all is Katherine Hepburn with four, followed by Meryl Streep, Ingrid Bergman, Jack Nicholson, and Walter Brennan. With a fifty-percent win rate, Day-Lewis isn’t even the most efficient—Brennan did it with a 3-out-of-4 career (though all nominations were for Best Supporting Actor, amazing in its own right, but not dominant like an Actor award). All of these actors, and the dozens of others with multiple nominations are tremendous at becoming someone else for art, and for money. So why do we talk about Day-Lewis in a separate breath? The conscious conversation steers this way. The first hypothesis is his gender; for worse, the Actor award is deemed more prestigious in the narrative. In 50 years, assuming the awards last that long, the conversation will drift away from this narrative. It is unfortunate, but true, that many of the stories told so far have been about men, whose funding sources are men, who have decided that these are the stories worth telling. Certainly, this leaves thousands of amazing stories to be told about the women who have shaped our world for thousands of years. But as long as the balance of power in writing, producing, directing, financing, and bandwidth lies with a network of unimaginative or opportunistic men, Daniel Day-Lewis will have his pick of the litter if he should decide to take on a new role. That said, an audience can see how long it takes Day-Lewis to become his character. He has not earned his title by fiat, but by the collective critical crowd, who have deemed his work mostly perfect. Perhaps there is something about the actor, an innate personality quirk that has given him the ability to be someone, to mimic a whole other person, while demonstrably keeping himself, however far along he is, private. If we accept his masculinity as a large chunk of his success, and all the privileges it had afforded him, then we can hypothesize a big second chunk to his ability to capitalize off his success, and use his power and fame to disappear and reemerge whenever roles like Christy Brown or Daniel Plainview manifest. There is something to be said for the man who has everything and only wants a piece more. He pours the rest into his roles. He has arrived; and then is gone. He is a culmination of his work. In particular, Driving Miss Daisy was a terrible choice, both because of the quality of 1989’s competition and because the treatment subject matter is part of a larger problem: racial animus—hatred—cannot be simplified or explained away via a film anecdote. Thirty years later, as Green Book showed us in 2019, film producers and the Academy need a deep look internally. 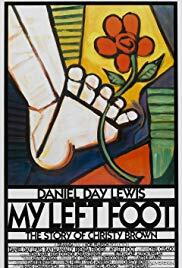 Especially when compared to classic performances in My Left Foot and Born on the Fourth of July, and well-loved warm movies like Field of Dreams and Dead Poets Society, winner Driving Miss Daisy leaves too much to be desired in all aspects to deserve the top award.